I’d like to think it’s not just me. Doesn’t everybody harbour a few items in their home which, when considered out of context (which is to say, ‘by any sane human being’), are just a little… um… creepy? Some things are intentionally creepy, and that’s okay. For instance, I love this candle-holding sculpture my sister gave me years ago: As the candle flickers, its eyes glow and seem to follow you around the room. Totally creepy, but in a good way. He’s cuddly-soft, and his name is Bob. Don’t ask. Moving on up the ‘disturbing’ scale, I also own two rubber chickens that reside in the planter in my living room. Well, to be technically accurate, one’s rubber and the other is silicone, which is even grosser than rubber because it’s all wobbly and floppy. It squawks when squeezed – a horrible half-strangled wail like bagpipes possessed by the spirit of an evil piper who died in the throes of an asthma attack. But the top ‘Creepy and Disturbing’ award goes to our dining room furniture. You’d think it would be pretty difficult to make shudder-worthy dining chairs. And I’m not talking about physical discomfort. No, I’m talking about the kind of creep factor that sends a shiver down your spine and makes you question whether you really want to turn your back on the item in question. I mean, seriously, what sick and deranged mind thought it would be a good idea to carve this on the back of a dining-room chair? Would you turn your back on this? It looks like one of the minor demons from hell, perched at exactly the right height to chew a crippling chunk out of your spinal cord with its fiendishly gaping mouth. Then once you’re incapacitated, who knows what it might do? This dining-room set belonged to my husband’s grandparents, and as far as I know they lived healthy, normal lives unmolested by denizens of the Pit… but these chairs give me the shivers anyway. I’ve lived with them for over a decade by convincing myself that, like gargoyles, they’re fierce guardians of our home. If anybody ever threatens us, look out! The chair demons will get them! Anybody else harbouring satanic furniture or other creepy items? Woohoo! I’ve finished the draft for Book 8, and it’ll be off to my beta readers / editors this week! Well, that explains a few things! My fridge has it in for me – it keeps whacking me on the back of the head whenever I straighten from reaching for something in the lower compartment. Maybe it’s trying to tell me I need to go on a diet… though it seems to get me most often when I’m reaching for something in the crisper drawer, which is where the healthy food lives. Maybe it’s trying to tell me I should be drinking a beer instead. I like your candle demon, Diane – I like that kind of thing! 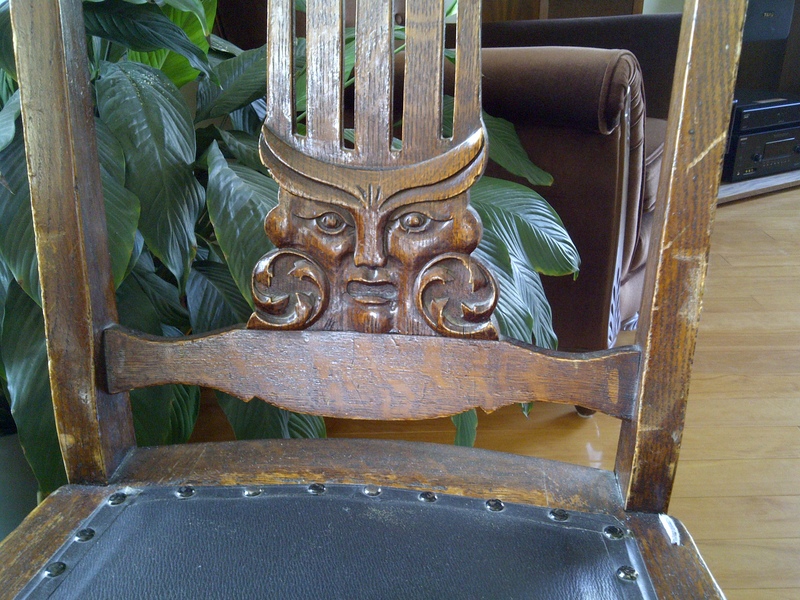 And, do you know that the face on the chair is not dis-similar to some of the faces I see when I see the ‘Spirit of the Trees’? That makes perfect sense to me, carving a face like that, I mean! 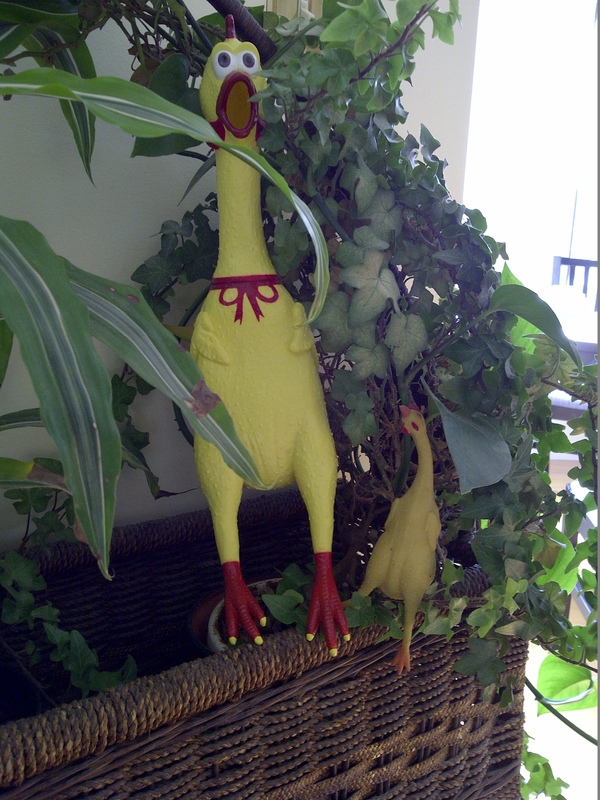 Your chickens made me smile – in total contrast to both the planter and each other! As a real Canadian, I think you could make an hysterical posting about that, so I’m submitting the idea to you. Should you choose to use it, it is yours, free and clear with no need to mention me at all. I would just get huge enjoyment out of whatever you came up with, as I do of all your posts. I’m currently rereading your books and enjoying them just as much the second time around. Thank you for some wonderful hours of enjoyment. A collection of ‘creepy and disturbing’ home demons seems like an excellent way to rid yourself of house guests who have overstayed their welcome. Hahaha!! 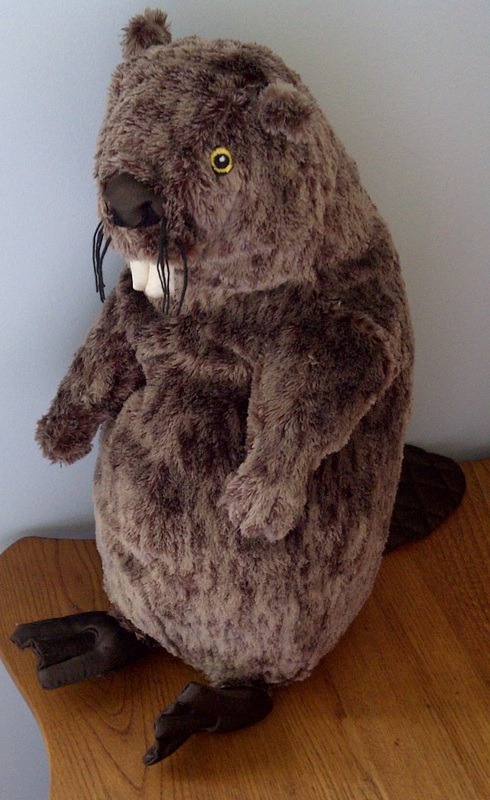 Just walk away from the beaver discussion. Walk. Away. Now. And yes, I’m harbouring some extremely odd treasures my niece brought me from Japan and Korea. One is a “splat pig” – a liquid-filled silicone sphere that’s designed to be thrown at a flat surface, where it deforms into a disgusting splatter pattern before slowly pulling itself back together to regain its original shape. It never fails to crack me up. And I also own a keychain decorated with a couple of little anime-type characters – a larger humanoid one holding hands with a little squirrel-like one. And they both have itty-bitty half-spherical hard-ons. Apparently there is a correct Japanese term for that particular um… appendage? Condition? Whatever. I can’t remember what the Japanese word is, but it translates to “moss-ball erection”. So there you go: your cultural lesson for the day. This is why you keep coming back, right? This post is going to result in some really disturbing search terms popping up on your stats page. Congratulations on finishing your book. Only creepy thing around our house is me but so far I haven’t been repossessed. Have you been to Beaver Liquors in Banff, by the way? Bahahaha! Beaver Liquors. Oh, dear. No, I haven’t. But I’m planning a trip in a couple of weeks, so I must go and check out their wares. Or is that “services”…? There is also a Love Shop called “Head and Tail”. You can check it out too. Hmmm, sounds like it’ll be an interesting trip! I love those chairs! Of course, this comes from a woman who has an ugly gargoyle perched in her front yard near her bushes. I do it on purpose because my community is known for being over-restrictive with what homeowners can do. So my ugly little statue is my passive-aggressive nose snub. LOL! Hey, as long as he pays for their rental, I’m open to negotiations. I’d let him buy the chairs, but I’d be afraid they’d come back to haunt me if I did. I also have a little Buddha statue in my backyard. Even I can’t explain that one. I like that – Buddha seems like a cheerful sort. Maybe he’s balancing the gargoyle’s hostility. Yes, that’s it. Yin and Yang. I’d like one of those to put in the little pond in our front yard – what a hoot! Harbor Freight had one similar to my friend’s a while back. Might be worth a look. Just a thought. Love it! The beaver sort of baffles me tho’, don’t know whether to actually look at it or pass it up but I still laugh when I see it. I want to say “aww, poor little guy.” The chickens are creepy, almost nastily (is that a word?) so. 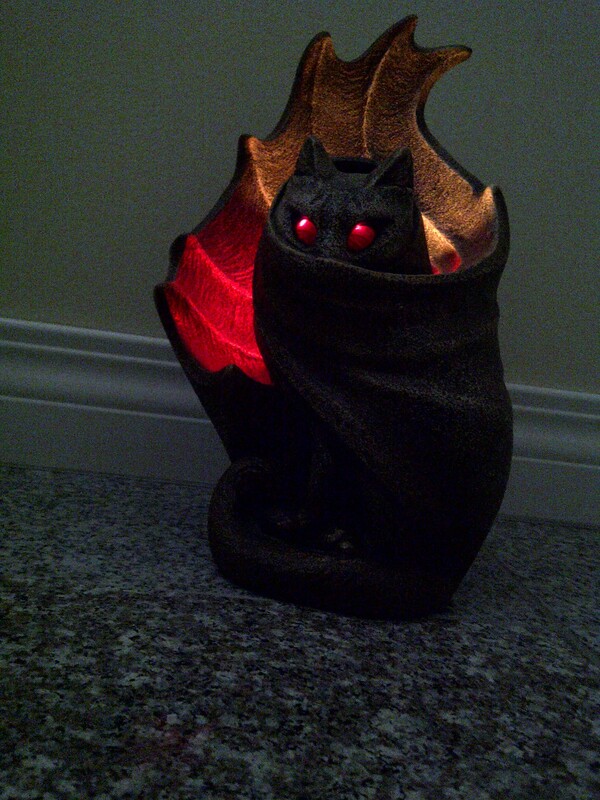 Love the chair and love the bat candle holder but that’s because they sort of fit in with my little…. “world”? Hubby just walks around my things and shakes his head and sighs. I’m thrilled that your book is almost ready! I’ve started my re-read, again, of #7 just to bring me back up to date. LOL You deserve a really good vacation when it hits the shelves. Oh and congrats on finishing number 8! Fantastic! Like Nelson I am afraid my house is rather boring in comparison to yours. I definitely do not like creepy. Opening our front closet with assorted running, cycling, hiking gear I could venture that the aromas wafting out are certainly creepy. Might even resemble something half dead…which isn’t too far from the reality when I throw my gear in there. Does the little rubber chicken lay an egg when you squeeze it? I have one just like it – it’s a stress release. Supposedly. I can’t stop laughing when I use it, so it must work. I just watched this episode of Antiques Roadshow the other night – this chair was appraised at $15K. It lays an egg?!? Okay, I can’t stop laughing just thinking about it! LOL I won’t even venture a guess.